Apps are the heart and soul of the Android tablet experience--but for new tablet owners, it isn't always easy to figure out where to begin. While Google's Android Market offers a small section of "featured" tablet apps, it doesn't provide a comprehensive list of programs that are optimized for the larger screen. And, while most Android apps will run on a tablet, those that are built explicitly to take advantage of the devices' larger screens tend to provide the best experiences. I've spent countless hours finding and testing Android tablet apps to uncover the best of the best. Here are 11 essential apps every Android tablet owner should consider. Google's standard tablet keyboard is fine, but trust me, you can do better. Grab SwiftKey Tablet X, available for exactly $4.99 in the Android Market. 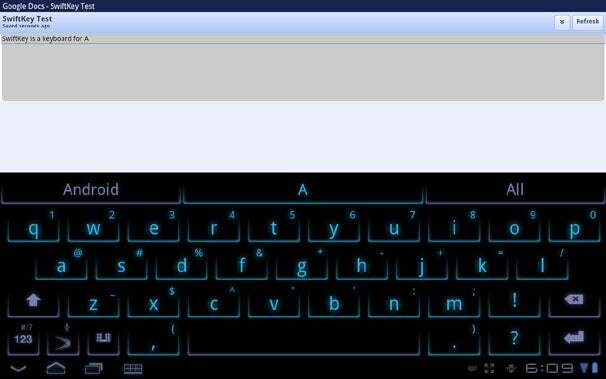 It gives you a pimped-out keyboard that does all the hard work for you (well, most of it): SwiftKey uses a special "prediction engine" to analyze your typing habits and thereby predict your words before you type them. I never cease to be amazed at how often SwiftKey's predictions are right (and how much key-tapping that saves). SwiftKey is fully customizable, too, with multiple color schemes and an optional split-screen mode for thumbs-only input. Altogether, this app is a must-have add-on for any Android tablet. Android tablets pack plenty of multimedia potential, but what good is having photos if you can't edit them on the fly? PicSay Pro, available for $3.99 in the Android Market, gives you everything you need to make your images pop. 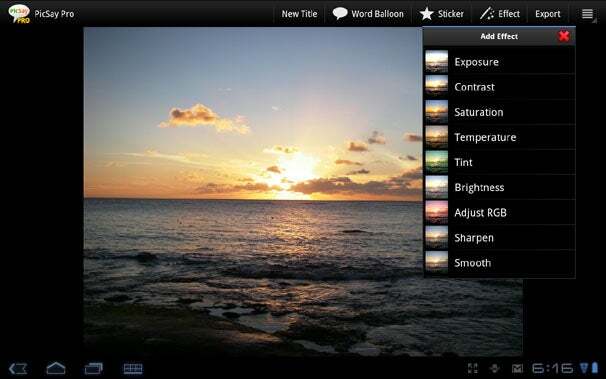 Its tablet-optimized interface has easy-to-use tools for resizing, rotating, cropping, and flipping photos. Aside from being useful, I found the app fun to use: A couple of taps, for example, will let you paint on your pictures or apply a dizzying array of advanced effects, ranging from contrast and color adjustments to red-eye fixes and funky filters. If you plan on handling photos in any way from your tablet, you'll definitely want this app in your arsenal. One of Android's advantages over other tablet platforms is that it allows you to browse your device like a computer: You can drag and drop files from your PC and access the tablet's full file system, moving through directories and opening, copying, or sharing files as you wish. In order to do this, you need a good file management utility. My pick is File Manager HD, available free in the Android Market (with an optional $2.49 in-app donation to eliminate a small on-screen ad). 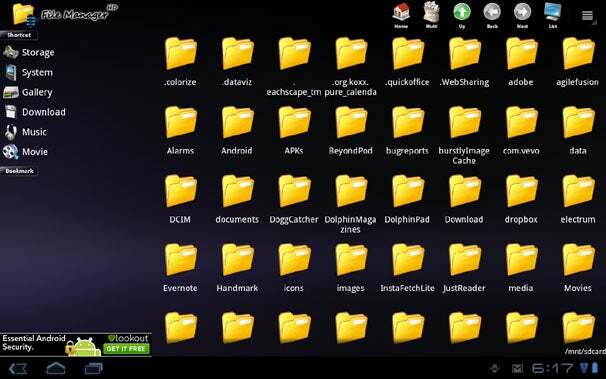 File Manager HD makes full use of your tablet's display area with its multipaned, intuitive interface. It even boasts integrated support for file compression and decompression, as well as the ability to access remote systems via LAN or SMB connections. Who doesn't love movies? The aptly named Movies app, offered free from Flixster, gives you everything you could possibly want to get your Hollywood groove on. When you open the app, you see a list of all the current movies showing that day. Tapping on any film brings up a panel with a detailed description, local showtimes, images, trailers, cast info, and reviews from critics and users alike. You can browse through upcoming theater releases and DVD releases, too, and search for any movie--past, present, or future. I like the app for its ease of use and the sea of information that it puts at your fingertips. 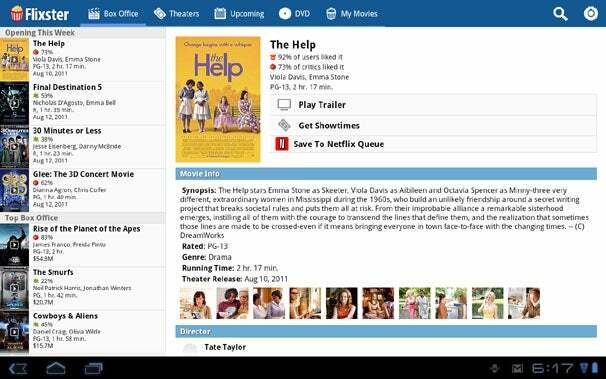 The Movies app even features Netflix integration, allowing you to manage your streaming queue and to add any title with a single tap. 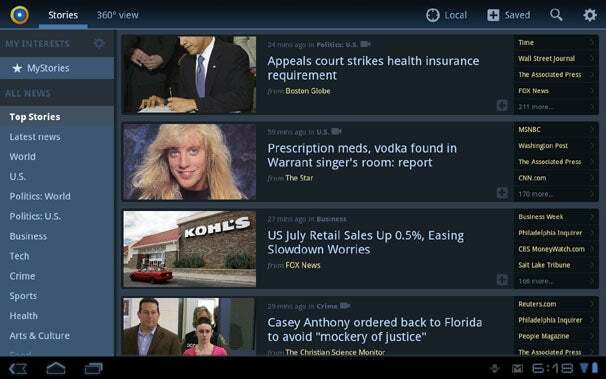 When it comes to news and tablets, no one does it better than News360. The News360 for Tablets app acts as your own personal news aggregator: While other apps allow you to browse specific sources or access RSS subscriptions, News360 tracks all the current hot news topics and gives you lists of sources to choose from, kind of like Google News. If you want, it can even study your social media and Google Reader habits and use that data to automatically find content that caters to your interests. I found News360's interface to be clean, crisp, and carefully crafted to take full advantage of Android's tablet-centric features. Best of all, the app is free. 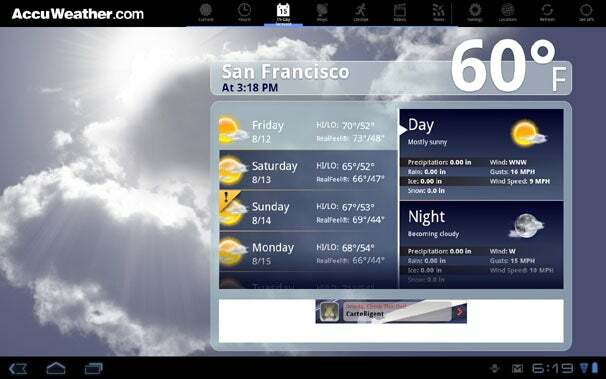 Get the weather in style with Accuweather's free Accuweather for Honeycomb Android app. The app gives you a gorgeous graphical display of current conditions in your area, using your tablet's GPS to figure out where you are. You can put that info right on your tablet's home screen, too, thanks to the app's attractive multicity widget. Within the program itself, you can see the forecast hour by hour or switch to a 15-day view to plan ahead. You can even get detailed info about how the weather looks for a specific factor like grass growing, bicycling, or asthma risk. The Accuweather app has interactive radar and satellite maps; it also offers a selection of national and regional forecast videos as well as the latest weather headlines from around the world. Next: Apps for making lists, docs and spreadsheets, remote accessing, tweeting, and Facebooking.